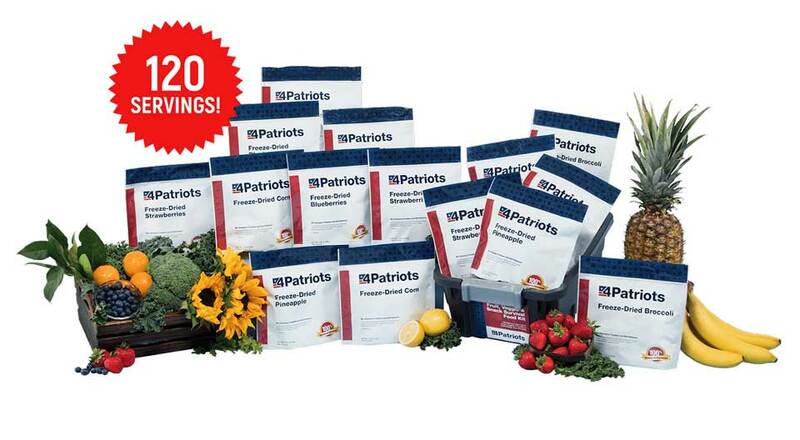 Fruit, Veggie & Snack Kit - $97 FREE SHIPPING! We’ve ordered quite a bit of your food and have tried some of it. My family loves the banana chips! Strawberries were fresh like astronaut food! Broccoli wasn’t a hit dry, but adding hot water and butter and salt, it ROCKED!! Green beans are ok dry—super fresh-but more likely to go over with the kids once reconstituted. It’s reassuring to know we have tasty food should things ever go south. Thank you for all you do! My review is going to be very short. One word describes it all........ WONDERFUL!!!!!!!!! Guarantee #1: This is a 100% money back guarantee. No questions asked. If for any reason you’re not satisfied with your Fruit, Veggie & Snack Survival Food Kit, just return it within 365 days of purchase and I’ll refund 100% of your purchase. Guarantee #2: This is an unheard of 300% money back guarantee. It’s in addition to guarantee #1. If you open any of your Fruit, Veggie & Snack Kit items anytime in the next 25 years and find that your food has spoiled, you can return your entire Fruit, Veggie and Snack Kit and I will triple your money back! Q: Any chemicals used in the drying process? A: No. If it's not in the ingredient list, it's not in there. Q: How long will this food last? A. Your survival food is designed to last 25 years on the shelf. With proper storage, it may be good even longer! You’ll have peace of mind knowing that with proper care… your “backup plan” will be delicious for decades. The secret is in the packaging: first, your food is preserved using a proprietary “low-heat” dehydration process. Then, it’s carefully packed in Mylar to protect it from heat, light and moisture. Storage conditions can impact the shelf life of your food. Your survival food will last longest when in stable, cool temperatures… away from moist air. So for best results, always protect your food from heat, air and moisture. Avoid prolonged exposure to temps above 75 degrees F. And keep your food sealed until you’re ready to eat it. Q: Where is this food made? A. Unlike some brands, your food is made in an FDA-approved and inspected facility in the United States. All ingredients are prepared and packaged right here in the good ole US of A! As of 04/21/2019, inventory is available and when you order today you will instantly receive an order confirmation by email. We anticipate being able to ship your order within 1-3 days. Our goal is to get your order out the door to you as quickly as possible! We will ship your order directly to your home or office using a premium carrier such as UPS and you will have it within 7 to 14 days of shipment. Products are shipped from Utah, USA and we will send you a shipment notification email with tracking number as soon as your order ships so that you can track it right to your door. We are unable to guarantee today’s pricing beyond today. Our pricing often changes due to the constantly changing prices of the high-quality, made-in-the-USA ingredients. Also, the recent attempt by FEMA and DHS to hoard survival food may result in decreased supply throughout the market. To guarantee our lowest pricing, be sure to secure your order today.